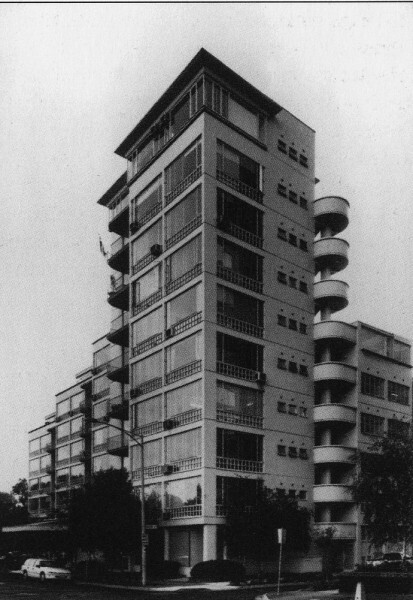 Stanhill is the largest of the distinguished series of apartment buildings designed by the Swiss-educated immigrant Romberg before he entered into partnership with Roy Grounds and Robin Boyd in 1953. Regarded as Romberg’s finest work, Stanhill is a highly modelled work of reinforced concrete incorporating a complex formal pedigree. Designed in the early 1940s, its construction dragged over five years due to postwar shortages of labour, materials and finance. On completion critical reception was mixed, its busy, sculptural appearance at odds with the rationalist tenor of the times. It has subsequently been reassessed as a striking amalgam of influences.